Today, the group meets on the the third Tuesday of the month for talks and oftentimes will organize hack nights on the first Tuesday. This month’s meetup, happening December 16, 2014, will have two speakers. The first is Susan Hinton, a Sr. Front End developer at Zappos who pursues a variety of interests including 3D printing and electronics. The second speaker is Dean Curtis, a co-founder of Fandeavor a startup that creates dream experiences for sports super fans. “He will be speaking on getting “stuff” done on a day to day basis at Fandeavor,” Pawel Szymczykowski said. 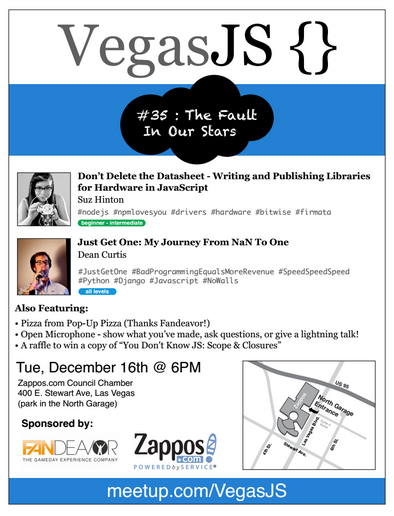 The VegasJS group is organized by Jimmy Jacobson, Jen Wilhelm, and Ethan Duggan.